Members of the University community stepped back in time Thursday evening—500 years, to be exact. 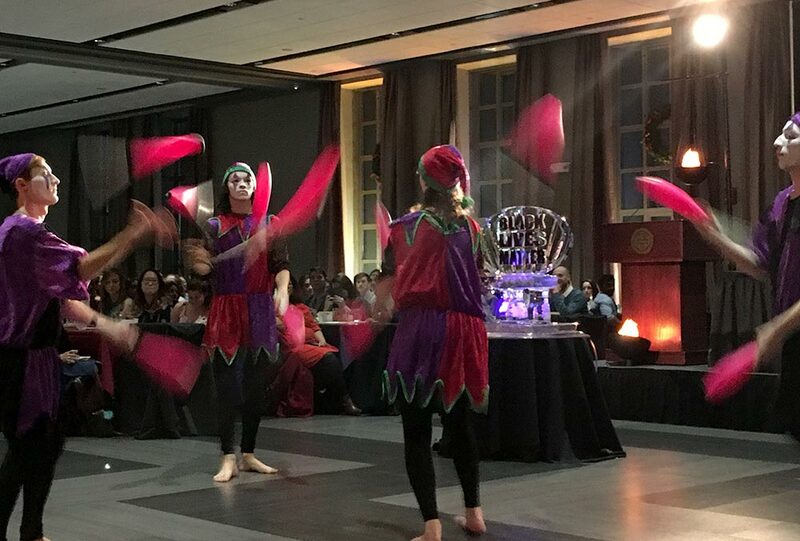 Feldman Ballroom in Douglass Commons was transformed into a 16th century English court for the annual Boar’s Head Dinner, a University tradition since 1934. Nearly 500 people attended, many clad in medieval costumes, and the menu included roast pork loin, turkey, pumpkin and lemon bisque, butternut squash and sage gravy, golden raisin and apple stuffing with sourdough bread, berry crumb cake, and apple cider. 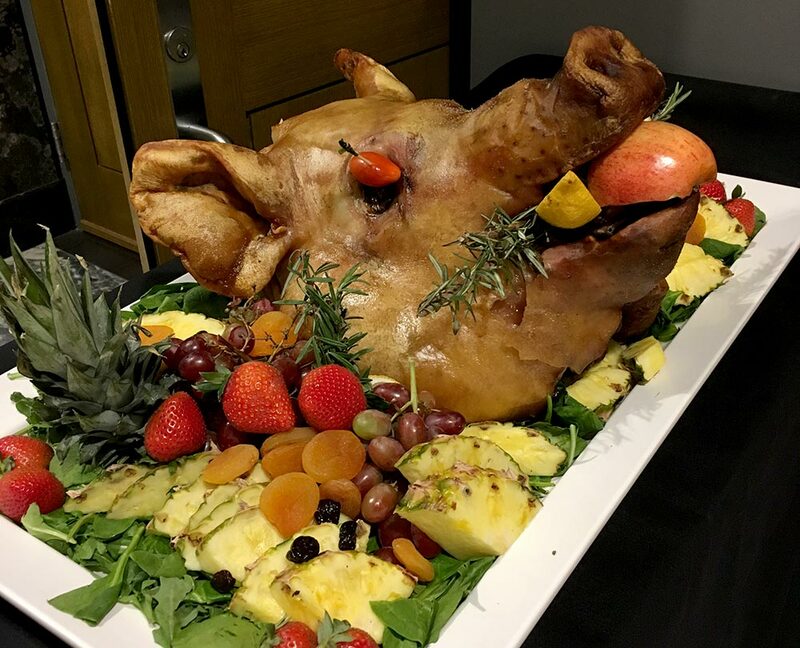 The banquet was inspired by a 16th-century Oxford University legend in which a student walking through the woods was attacked by a wild boar and saved by a fellow scholar who thrust a copy of Aristotle’s work down the boar’s throat. The banquet was instituted by the College to celebrate the triumph and survival of the students and has been held every year since 1934 except 1943 to 1945, when it was suspended due to World War II. The dinner starts with a trumpet fanfare and an introduction of the Highe Table. Student a capella and theater-based groups also perform. Matt Burns, dean of students, made his 15th consecutive appearance Thursday. Each year, a student organization wins the Boar’s Head award for having the greatest impact on student and community life at Rochester. 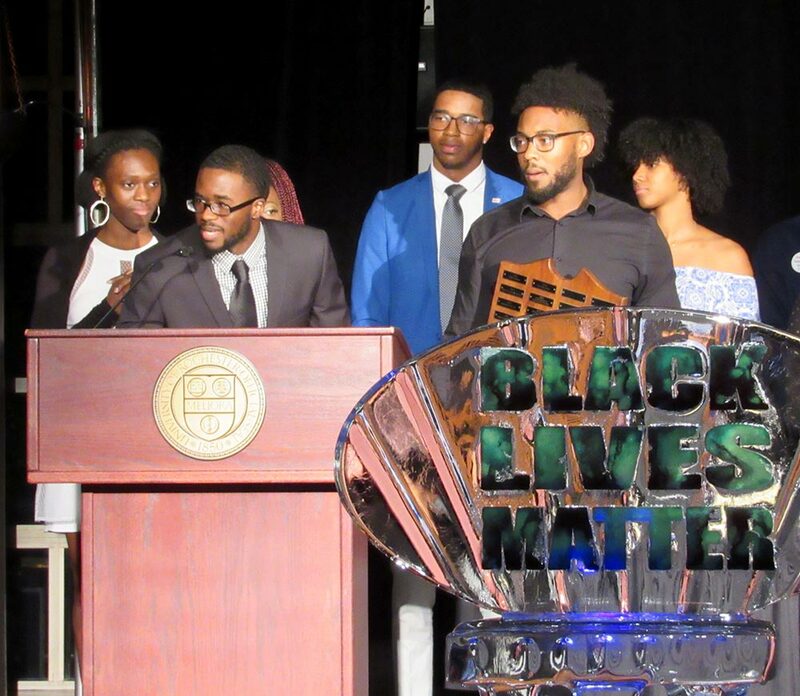 Last year’s winners, the Douglass Leadership House, presented the award this year to the Pact. A new organization founded in 2016, the Pact is a mentorship program that pairs a University undergraduate student with a local high school student for weekly mentoring sessions that emphasize the values critical to success: persistence, optimism, and independence. The Strong Jugglers perform during the feast. 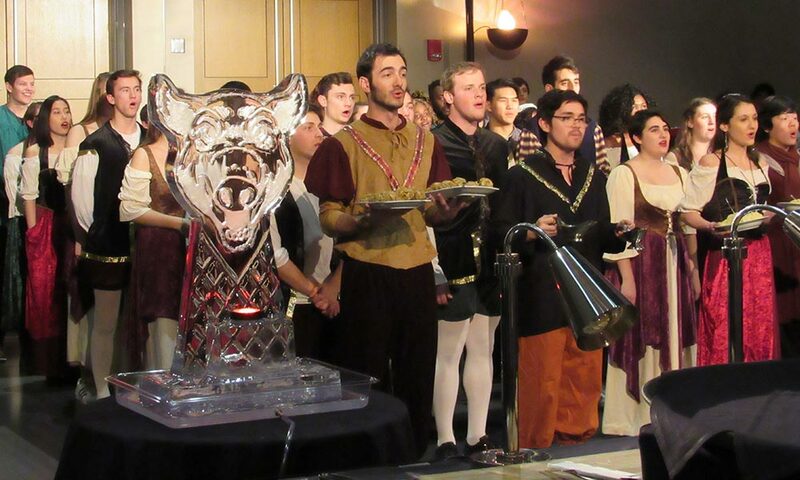 The annual “reading of the boar” tells the tale of the scholar who slew a boar through his love of learning. Each year the tale takes on a different twist. 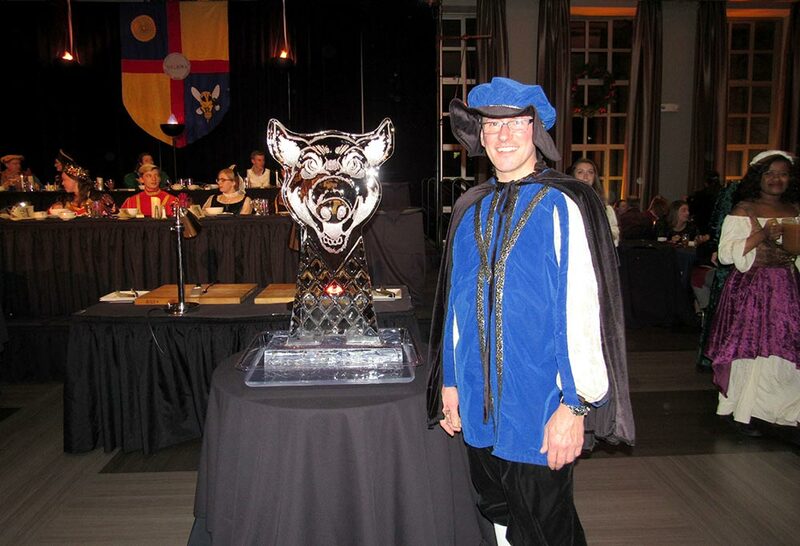 Dean of Students Matt Burns attends the Boar’s Head Dinner each year. Last year’s Boar’s Head Award-winning organization, the Douglass Leadership House, passes the award on to this year’s winners, the Pact. 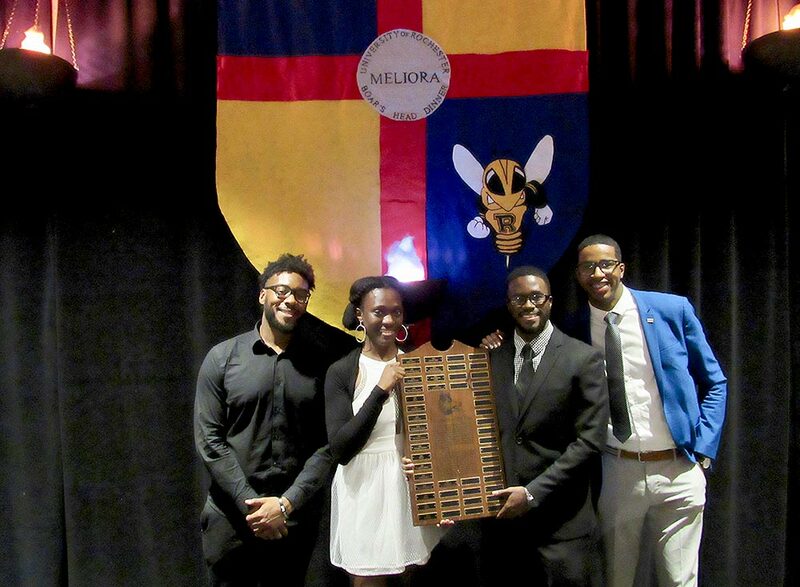 Members of the Pact with this year’s award, presented to a student organization at the Boar’s Head Dinner each year. 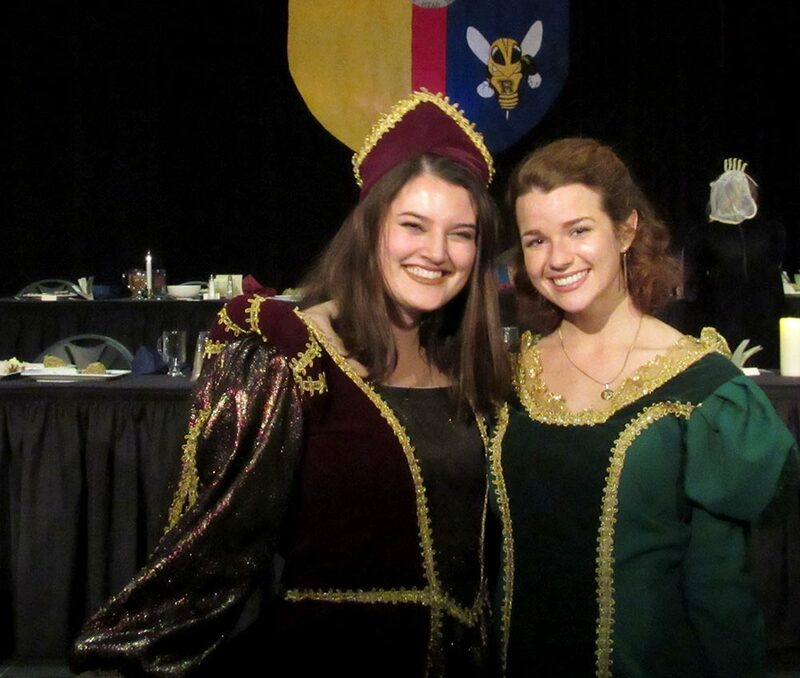 Student Association president Jordan Smith ’18 and vice president Becca Mooney ’18 pose in full medieval dress.